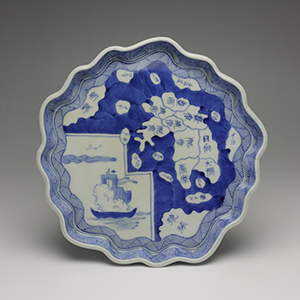 A porcelain dish with the map of Kyushu measuring some 24 centimetres in diameter is kept at the Lisa Sainsbury Library as part of the Cortazzi map collection. 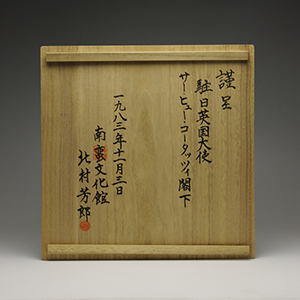 The inscription on the underside of its wooden box lid mentions the content being a gift to the then British Ambassador to Japan, Sir Hugh Cortazzi from the Director of Namban Bunkakan Museum, Kitamura Yoshiro on 3 November 1983. This day is observed as the ‘Day of Culture’ in Japan and is one of the country’s national holidays. In general ‘map dish’, as they are commonly referred to for their illustrated map designs, can be categorised into three types: Gennai ware, Kutani ware and Arita ware. The term Gennai ware comes from Hiraga Gennai (1726-1779) a prominent historical figure who was the first to use pictorial maps as dish decoration design. Gennai was born as the third son to a low-ranking samurai family in Shido, a town in present day Sanuki city of Kagawa prefecture. He studied Confucius, poetry and pharmacognosy, and under the order of his domain lord, became a student of Rangaku, study of Dutch matters, in Nagasaki. After severing ties with his domain lord, he moved to Osaka to learn medicine and medicinal herbs before moving to Edo to further his study in pharmacognosy and Confucius. Gennai introduced a type of ceramic ware using Cochin ware technology he learned in Nagasaki. Eventually, this three-coloured stoneware came to be known as Gennai ware, or at times referred to as Shido ware. They were made in Shido from Horeki 5 (1755) with designs that included maps of Japan and of the world, both the western and eastern hemispheres. However, the number of surviving examples of this type of ware is unfortunately rare. Examples of Gennai ware could be viewed from the Kobe City Museum’s website. 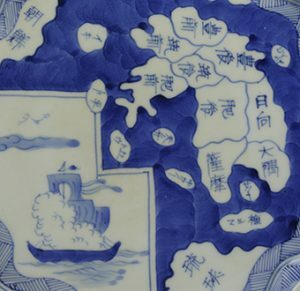 The surviving examples of map dishes made in Kutani are limited to those depicting the image of the Japanese archipelago in gosu cobalt blue. Furthermore, many of them tend to prominently feature Kaga domain, Kutani ware’s home country. The domain and country names are denoted in katakana, a type of phonetic characters used for denoting foreign words, inside their border outlines. In comparison, in the third type of dishes, Arita wares, the domain and country names are written in kanji Chinese characters. Some of the Kutani ware map dishes have inscriptions on the back that reads ‘Bunsei nensei’ suggesting that the dishes were made as early as the Bunsei period (1818-1830). There are only a few examples of Kutani ware map dishes and they generally fall into two formats: bird shaped or lobed. In Arita, map dishes were made in abundance from around the Tempo period (1830-1844) to the end of the Edo era (1615-1868). The maps show either the Kyushu region, Japan, or the whole world. There are no examples featuring a specific area or region of Japan other than Kyushu where Arita is located. The plates are varied in their shapes from circular to rectangular and also in sizes from small to large. One notable characteristic of this type is that, unlike Kutani ware examples, Arita ware map dishes are often made using a press mould and have relief carving details with each region or country defined clearly by raised areas and with the county borders marked by incised lines. Other characteristics include the frequent use of wave patterns or in-fills around the landmass using gosu cobalt blue dotted with pictorial images such as flying cranes or sailing ships. Most of the Japanese maps depicted on dishes follow the Gyōki zu style, which renders the archipelago in a rudimentary manner. Towards the end of the Edo era, geographical maps were drawn with a level of precision that are not too dissimilar from those more familiar to us today. However in the case of the porcelain map dishes, it looks as though visual appeal was given priority over accuracy. The map dish on loan to the Lisa Sainsbury Library is a unique example of its genre. Its rim, shaped to resemble undulating waves, has a smooth surface with the image hand painted in gosu cobalt. According to Nonomura Keiichi’s book ‘ Oranda (Dutch) e imari’, the dish is ‘one of the oldest examples of map dishes’. Professor Ohashi Kōji, former Director of the Kyushu Ceramic Museum, dates the dish to around 1840s confirming its manufacture to the first half of the 18th century. The three-masted ship shown on the dish’s lower left initially appeared to the author to resemble a sailing ship with a steam engine bellowing smoke into the sky. However, having consulted Professor Timon Screech from SOAS, University of London, he informed the author that it was a scene of gun-salute practiced by the Dutch. During the period when this dish was manufactured, it was customary for Dutch ships to mark its arrival into the Nagasaki port by firing salutes called ishibiya. The sight and sound of firing canons were said to be great spectacles. Underneath the plate is the inscription of a certain Chinese character which the author would read as ‘inui’. Many Imari wares, including Arita wares, have this same ‘inui’ inscription, however further research is necessary in order to pin down the specific kiln where the objects with this inscription were fired. Akioka, Takejiro. Nihon chizushi. Tokyo: Myujiamu Tosho, 1997. Kato, Tokuro. Genshoku Tōki Daijiten. Kyotoi: Tankosha, 1972. Nanba, Matsutaro. “Katto kaisetsu” Gekkan kochizu kenkyū (1980) 129-130. Nanba, Matsutaro, Nobuo Muroga, and Kazutaka Unno. Nihon no kochizu = Old Maps in Japan. Osaka: Sogensha, 1969. Nonogami, Keiichi. Oranda-e imari. Tokyo: Bunka Shuppankyoku, 1982. Ogi, Ichiro. Imari no hensen: seisaku nendai no meikakuna kibutsu o otte. Tokyo : Sojusha Bijutsu Shuppan, 1988. Unno, Kazutaka. Chizu no bunkashi: sekai to Nihon. Tokyo: Yasaka Shobo, 1996. Yabe, Yoshiaki. Kadokawa Nihon Tōji Daijiten = Kadokawa, the Encyclopedia of Japanese Ceramics. Tokyo: Kadokawa Shoten, 2002. Kokushi Daijiten. Tokyo: Yoshikaw Kohbunkan, 1979. Kutani, Imari, Kakiemon, Nabeshima. (Aizōban Nihon no yakimono vol. 6). Tokyo : Kodansha, 1977. Kyushu Kotoji No Seika: Tanakamaru Korekushon no subete = The Essence of Kyushu Ancient Ceramics: the Elaborate Collection of Tanakamaru. Fukuoka-shi: Asahi Shinbunsha Jigyo Honbu Seibu Kikaku Jigyo Team, 2008. Oranda Bōeki to Koimari Ten: Arita Oranda Bōeki Shiryōkan Hatsukōkai. Tōkyō: Maininchi Shinbunsha, 1977.